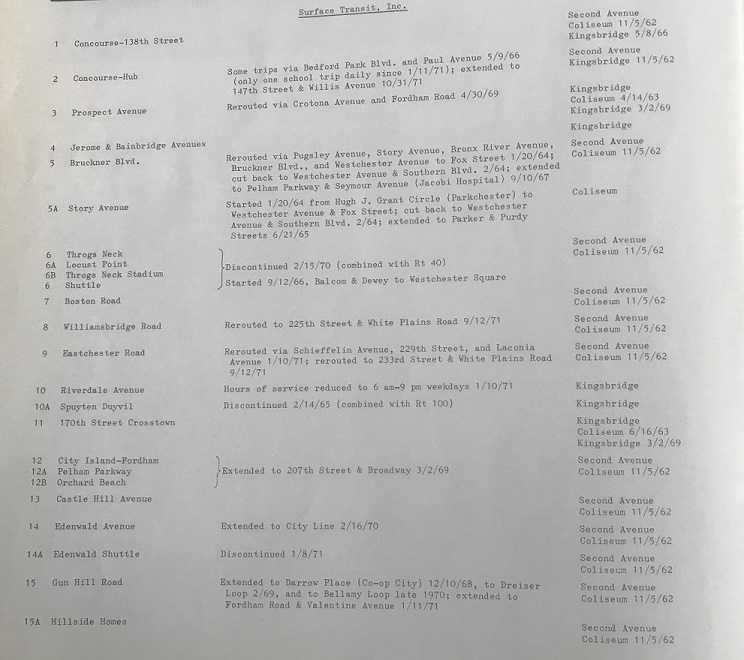 - According to a Jan. 14, 1966 Daily News article about the changes to bus routes along Fifth and Madison, the ex-FACCo Fifth and Seventh Avenues route was already referred to as '2A'; I presume by then its garage route assignment had been transferred from 132nd Street to 146th Street, and the 'A' suffix added on due to ex-NYCO 2 - Park & Madison via 116th Street already being assigned there. At what point would this depot transfer have been effective? I assume it preceded by some time the Fifth and Madison one-way conversions. It certainly explains how and why the ex-FACCo route had become '2A'. - A 1964 bus map put out by Bloomingdale's already had the (ex-NYCO) 1 - Park & Madison via 135th Street's southern terminus at South Ferry, and the 7 - Broadway, Columbus & Lenox Avenues' at 14th Street-Union Square West. 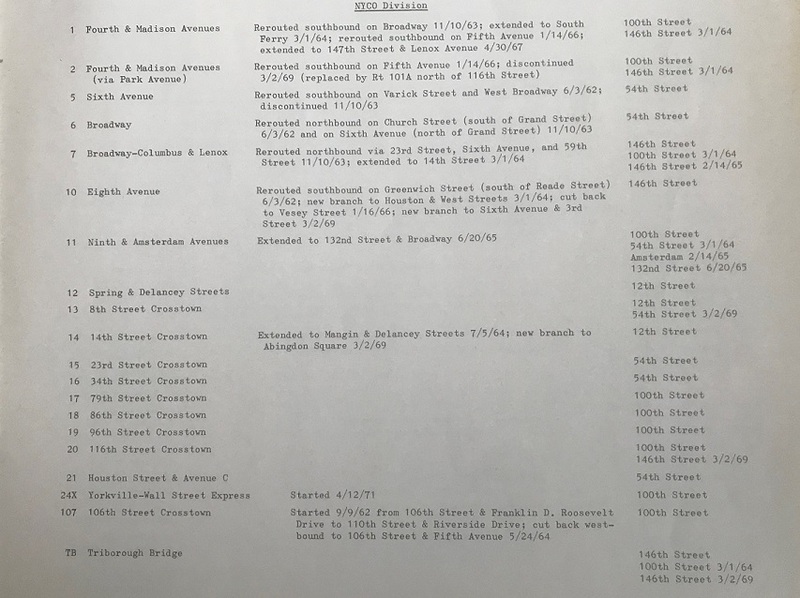 Would such south end extensions (from Park Row/City Hall and 23rd Street & Broadway, respectively) have taken effect on or about March 1, 1964 - the same day 7's transition route was shifted NB from 53rd Street to Central Park South, and SB from 54th Street to 58th from Ninth to Eighth, then Eighth to Columbus Circle and CPS to Seventh Avenue? - In the days of NYC Omnibus and then Fifth Avenue Coach Lines' NYCO Division, the 1's transition between Park and Madison was 42nd Street in both directions, and the 2's at 27th Street NB and 26th Street SB. When would the 1's transitions have been moved to 39th Street NB and 40th Street SB (likewise already in place by 1964), and the 2's NB transition to 25th (ditto)? And would the MaBSTOA piece have a list of routes and capsuled description of important service changes in the way the FACCo piece had? But in a sense, it was also a little premature, in that it was some months before the last GM New Looks ever ordered - T6H-5309A (4800-4919, ordered in two spurts) and express T6H-5310A (4500-4505) - were introduced to MaBSTOA routes, and on Manhattan routes the 'M' prefix began appearing on most lines (except the Jackson Heights and Elmhurst Crosstown which were designated QM15 and QM16, respectively); not to mention the opening of the vast Hudson depot, the reshuffling of many routes there, and the closure of 12th Street. 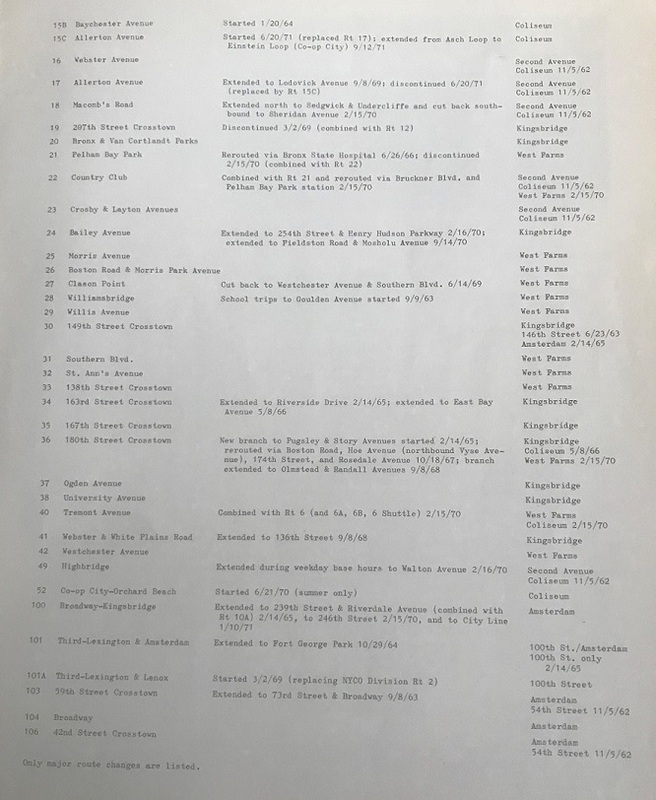 Plus two years before the great route renumberings (which saw Bx15C, which only replaced Bx17 in 1971, revert to Bx17 - only one example of 20).